About a year ago I made homemade granola for the first time. It went well, we ate every drop and then without even noticing, I resumed buying granola at the grocery store. This method worked well for our busy, unpredictable schedules and while life is no more predictable than it was then, I've realized that I really enjoy making food for the two of us to enjoy. It's important for all of us to make time for the things that fire us up, energize us and fill our cups. For me, that's trying new things, including new recipes. There is something really comforting about baking sweets on a rainy day and that's how I began my second batch of granola. After researching a handful of recipes on the internet, I combined my favorite parts of each. Since we flew through the first batch, I made a double batch this time so we can enjoy it twice as long. Wishful thinking, I'm sure. The absolute best part was the amazing aroma that filled our home throughout the afternoon. 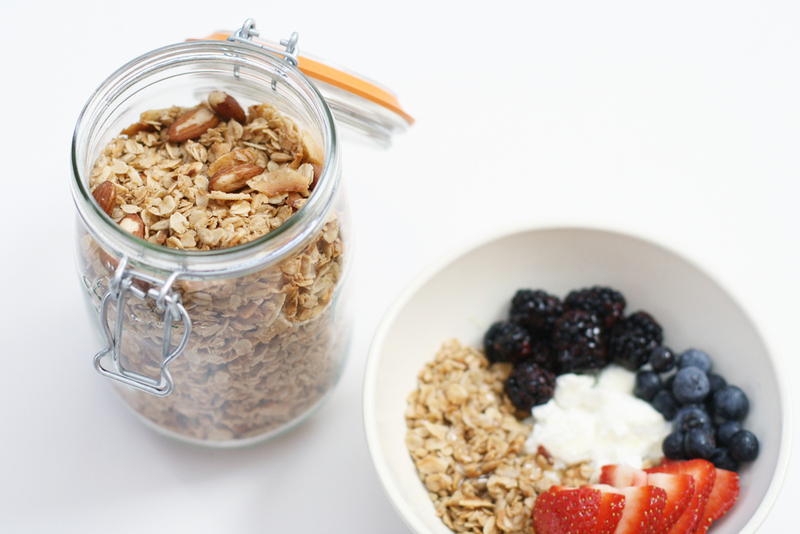 With two jars of granola filled to the brim, healthy and delicious breakfasts will be a lot easier for the next two weeks. steps 1 | Preheat the oven to 300 degrees. Line a large baking sheet with parchment paper. 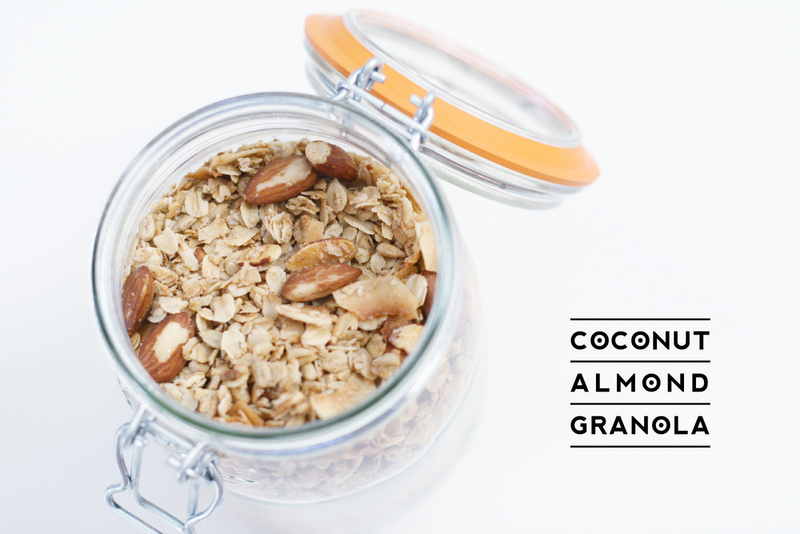 2 | In a large bowl, combine oats, coconut, almonds, sunflower seeds, brown sugar, cinnamon and salt. 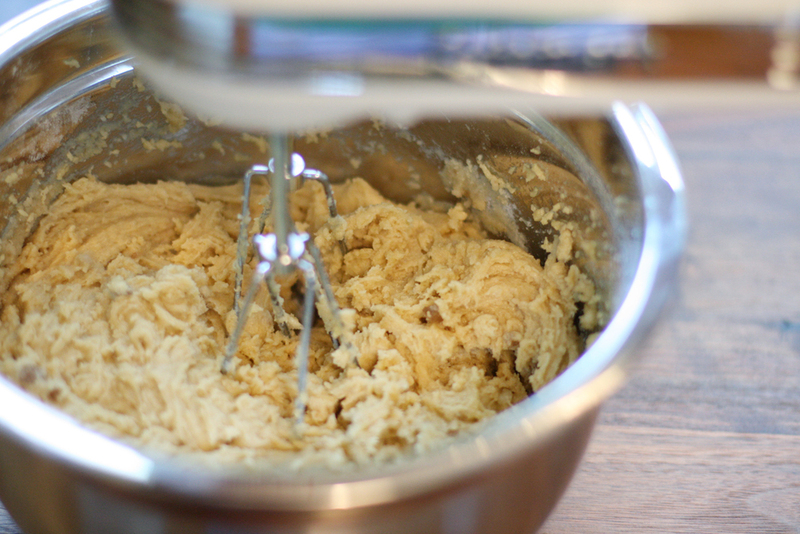 3 | In a small bowl, whisk together coconut oil, maple syrup, vanilla extractand almond extract. 4 | Pour liquid mixture over dry ingredients. Stir until dry ingredients are well-coated. 5 | Pour the granola mixture onto the baking sheet and spread into an even layer. 6 | Bake for 30 minutes or until granola is golden brown, stirring every 10 minutes. 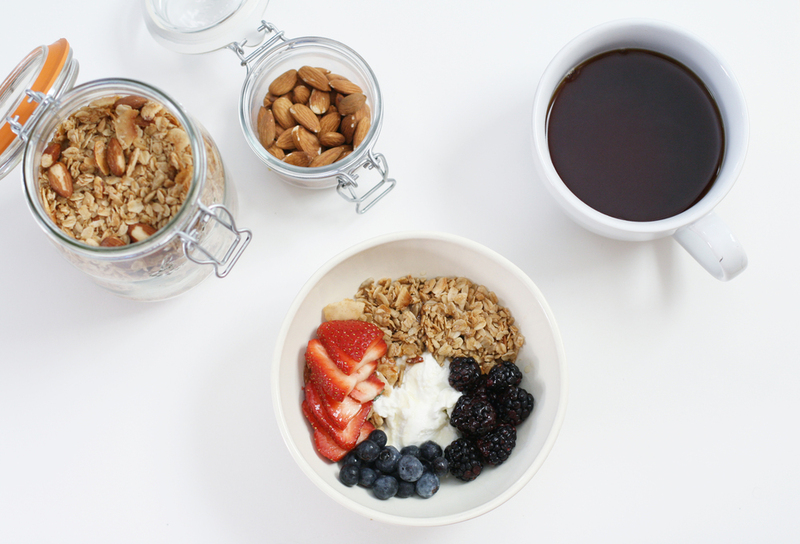 7 | Let granola cool completely. Store in an air-tight container for up to 1 month. I would describe my color palette as pretty minimal, neutral even, comprised primarily of gray, black and white with small hints of color. Despite my preference for neutrals when it comes to my personal style, I love to see and experience color in nature. Summer is a season filled with the most vibrant and lively colors. Some of my favorite summer colors can be seen in the many tomato varieties available during those hot steamy days and in the lush, green, dew-covered grass and bright blooms set against the backdrop of blue skies. 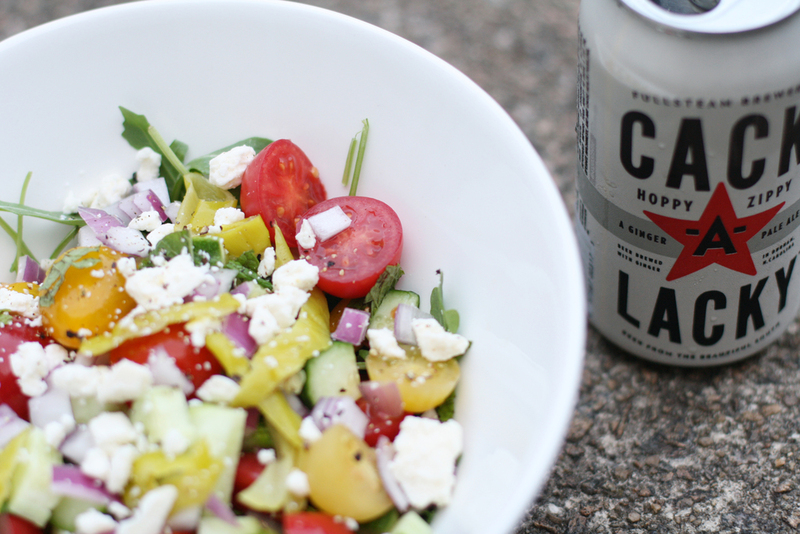 Inspired by a colorful bunch of juicy cherry tomatoes, I created my own version of what I later realized was just a more summer-y Greek salad. The result was super fresh and paired well with Stacy's pita chips and a refreshing, local ginger pale ale. Where do you experience your favorite colors in nature? Basil is my favorite herb of all time, with mint falling behind as a very close second. Despite my countless efforts to keep basil plants alive and flourishing for my own benefit, I just can't make it happen. With the exception of the ever resilient rosemary, I often rely on prepackaged herbs from the store. And since purchasing fresh herbs sometimes feels like a splurge, I try my best to use every ounce of these fragrant treats to create other tasty dishes. After finishing off the cobb salad remix, I had some basil leftover and an entire watermelon to eat in a matter of days. 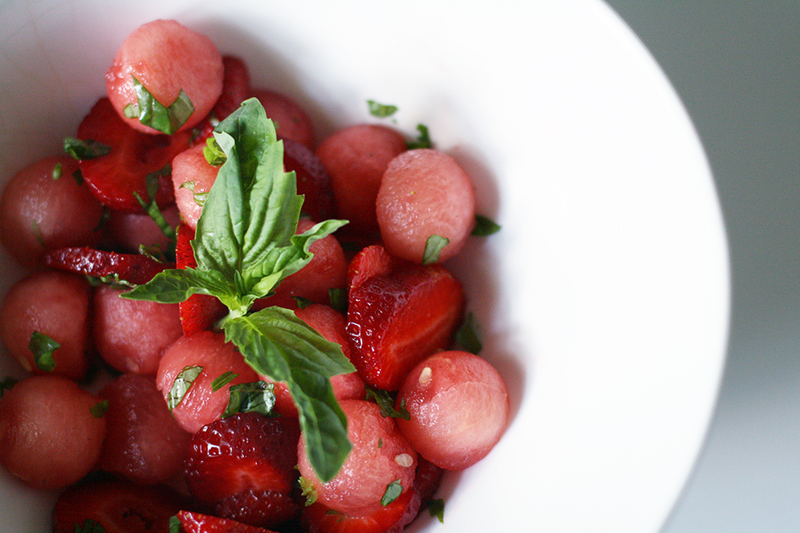 Without much thought, I decided to make a refreshingly, yet flavorful strawberry watermelon basil salad. It's super easy and a fun snack to enjoy on an afternoon spent playing outside or working in the yard. What are some of your favorite ways to eat watermelon? Let's face it. It's basically summer and I'm pumped for multiple reasons. Among these - longer days, afternoon thunderstorms, adventures, lightning bugs and salads. That's right. I'm looking forward to creating salads with all of the scrumptious produce that summer brings. Lately I've been experimenting with salad ingredients and I'm pretty sure I have a favorite already. Since I'm not a big meat eater, the traditional cobb salad doesn't really work for me. 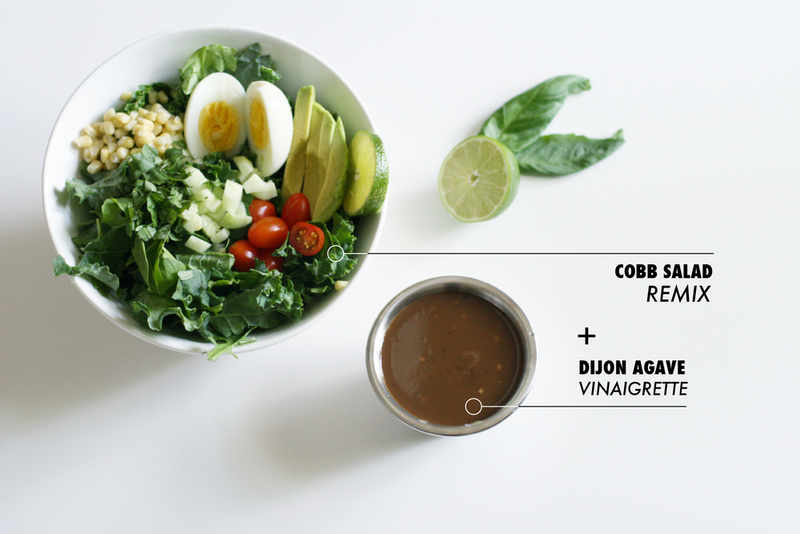 However, I do like most of the other ingredients so I decided to create my own version, which I (somewhat) jokingly named the cobb salad remix. One of the challenges of eating vegetarian, is getting enough protein to stay full. To make this a little easier, I chose to add a boiled egg, avocado and sliced almonds to the mix. That's it. This little vinaigrette is sweet and I can't get enough of it. Let me know what you think! Lately I've been thinking a lot about how to find more time to live. After all, it's called LIFE, right? But obviously if time were that easy to create, everyone would extend their days and weeks. At least every other week I've uttered to myself, "There aren't enough hours in the day". It's true. There aren't. However, I think it's time's finite nature that makes it so valuable to us. If we knew that we'd live forever, then we likely wouldn't rush around creating to-do lists or working vigorously to make things happen or savoring our favorite moments to the last drop. With my 30th birthday merely days away, I've been reflecting on life and what I've made of mine so far as well as what I hope to make of the next 30 years. I have found peace in a few certainties. It's impossible to have more than 24 hours in a day. To that same end, we can't dictate how many days we'll get or what challenges will come our way in the days we're given. We can only do more with the time we have. I read a quote recently that really clicked for me. With this quote in mind, I'm aiming to get more out of my weekdays, particularly the mornings. It's true that we all have hours in our day that are accounted for the minute we wake up, but I think the challenge is finding creative ways to use the periods in between our busy schedules to create lives we're proud of. 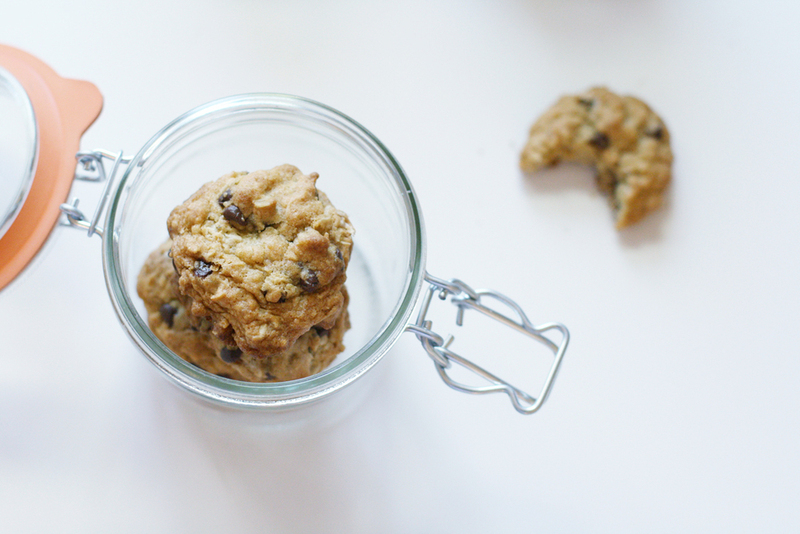 As we approach summer and the days grow longer, it gets easier to make things happen during the day, whether it be meeting up with a friend for an impromptu walk or baking cookies before work. Today I opted for the latter. 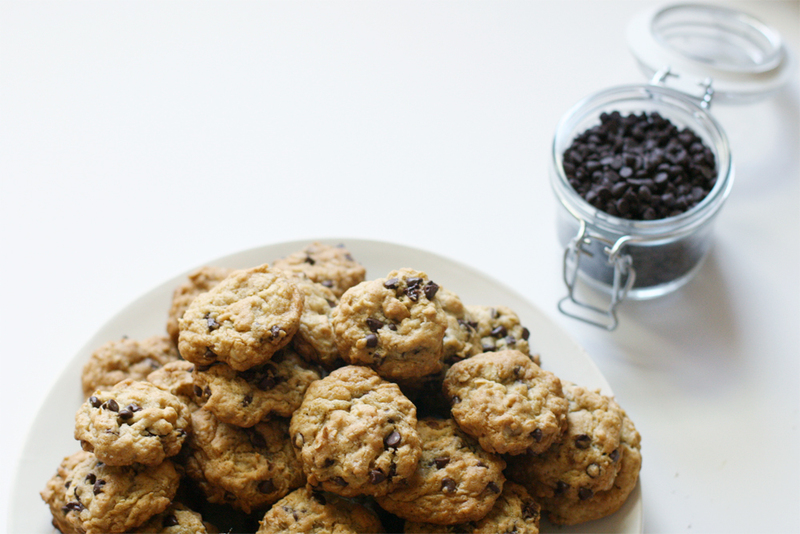 I woke up early, brewed coffee and baked batch after batch of oatmeal chocolate chip cookies, eating them as I went along. This morning was just what I needed. So friends, here's to squeezing more fun out of your week and creating more memories along the way. Copyright © 2017 Stacey Lanning | All Rights Reserved.